I usually cover here articles and books in such languages as English and German which is caused mainly by the fact that the news coverage on body modification is relatively small in Polish. This time, however, I’d like to write about something that I came across today and which, IMO, is really wrong. 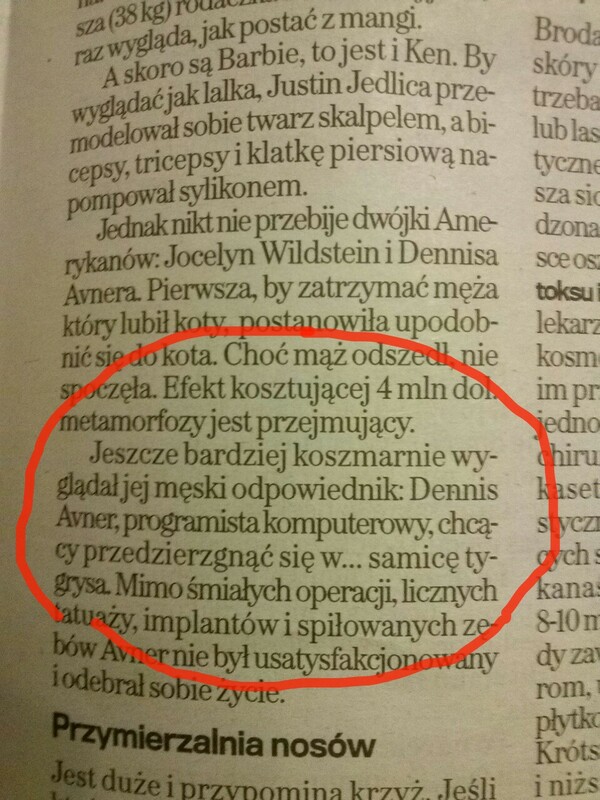 In today’s paper (and online) edition of the Gazeta Wyborcza newspaper there’s an article about plastic surgeries. The article is placed in the section called ‘wyborcza.biz: business, people, money’ therefore one can expect a professional attitude and covering a given subject in an honest way. I find this way of presenting the Stalking Cat unfair to say the least! It also makes me question credibility of the other information in the article – if the author presents The Cat in such a false and wrong way, what else he may have presented falsely? Sadly, in this case it seems that the main purpose of the author was to mention the Cat in a shameless attempt to cater to the closed-minded part of the Wyborcza’s readers and it makes me feel disappointed! One may ask why I’m so outraged by a tiny fragment of a bigger text on a subject related more to a conventional way of understanding body modification rather than the body modification based on traditional cultures and building one’s own identity by means of tattoos, piercings etc. and it’s written in an obscure language at that! The Cat can’t defend himself anymore and it doesn’t matter in what language you read distorted information on a given person. I’m writing this post on my own behalf as a modified person, I’m writing this on Shannon Larratt’s behalf who is no longer here to give us strength but, above all, I’m doing it because I think it’s the just thing to defend those who can’t defend themeselves! You can read more on the Cat and his reasons for what he had done on his own website and in a beautiful and touching epitaphium Shannon Larratt wrote after the Cat’s death!